Office Space - Shymkent, South Kazakhstan. 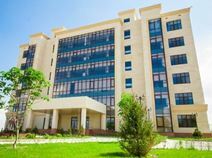 Next to the 5-star Kainar Hotel this business centre provides a fully equipped and furnished, modern office solution in a Grad-A building with plenty of on-site parking. Just a short walk from the Baidibek Bi Monument, this space is the perfect centre for those that would like to accommodate visiting clients. Nearby, there are many restaurants, cafes, supermarkets and shops to explore and enjoy outside of work.